Western Shooting © 1994 Art & Magic. 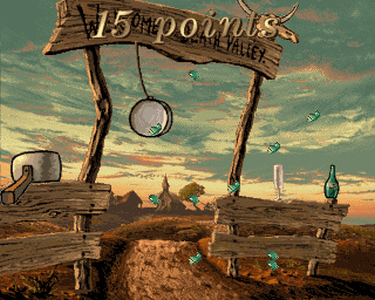 Designed within three months in 1994 as a special order from the Gauselmann Group, "Western Shooting" presented four original scenes all based on the scrolling planes hardware. An interface with a real size riffle allowed to shoot moving objects in a typical western village, in a bank, in a saloon and in a bar.